DIAT offers admission to PhD (full-time) in the frontier areas of Aerospace Engineering, Mechanical Engineering, Electronics Engineering, Computer Science & Engineering, Applied Physics, Applied Mathematics, Materials engineering and Applied Chemistry. A candidate, seeking admission to the PhD Program, shall be required to have passed the qualifying examination securing at least 55% marks or equivalent CGPA/DGPA. A relaxation of 5 % of marks may be allowed for those belonging to SC/ST/OBC (non-creamy-layer) / PWD - (Divyang) categories. 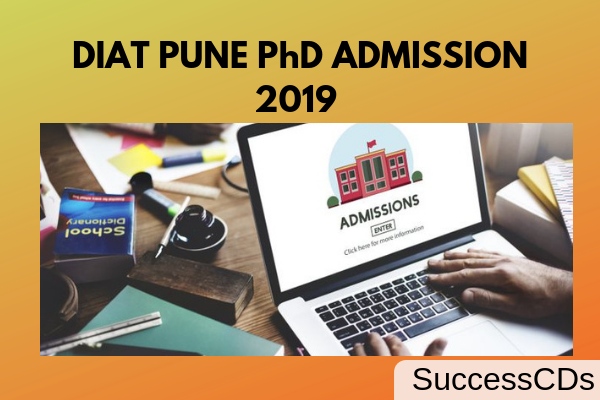 The filled application form in the prescribed proforma has to be forwarded in a sealed envelope, super scribed “Application for Admission to PhD Program in the Department of ______” to the Joint Registrar (Academics), Defence Institute of Advanced Technology, Pune 411025 along with the DD / online generated receipt and self certified copies of mark lists, certificates and other testimonials. These documents should reach DIAT latest by on or before 22nd November 2018. Postal delay will not be entertained.